Consumer payment amounts have been decreasing in recent years. Nationally, consumers are paying $903 per month on their bills, which could include a combination of credit cards, auto loans, leases, and mortgages. This amount is a decrease of 2 percent in the past three years. 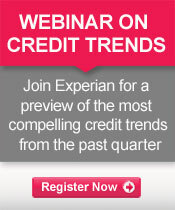 Watch a video on credit trends to learn more .